The Basement Doctor WV – The Contractor You Can Trust! Here at The Basement Doctor of West Virginia, we believe your word means everything. That is why we put our pledge to our customers in writing for everyone to see and hold us accountable. 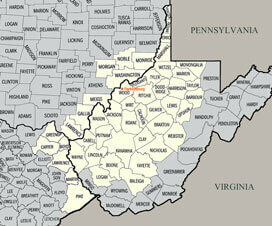 You can read it right here on this home page below our service area map. Our experts are dedicated to providing you with the best solution to your basement, foundation, and crawl space problems. We provide a free, no hassle, basement, foundation, and crawl space inspection along with written repair estimates to homeowners. If you have a wet or leaky basement, damp and dirty crawl space, mold or mildew problems, bowed walls, or cracks in your foundation walls, then we want to be the professionals you call for help. Basement Doctor WV provides a large assortment of basement waterproofing services that you can depend on. When it comes to wet basement repair, our team provides a variety of effective systems, including: interior drain systems, exterior drain systems, sump pumps, dehumidifiers, and a lot more. For foundation repair, we are able to assist you with problems regarding foundation Cracks, or bowed walls. It doesn't matter what has caused your foundation problems, Basement Doctor WV can supply your home with strong and reliable foundation repair products. We want to make sure that nothing is endangering your home's structural integrity. Our crawl space repair services include waterproofing, insulation, sump pump installation & replacement, and crawl space supports for sagging floors. We always do the right thing! WHY? Because it’s the right thing! We do what we said we would do, when we said we would do it and the way we said we would do it. Are we perfect? No. Will we come up short once in a while? Yes. But, we will always do what's right! Your crew was very punctual, polite, and professional. I was home alone & was very comfortable with them in the house, which is very important to me as a woman. I was more than pleased with the work & have already recommended your waterproofing company to friends and family. I am highly satisfied with the job you did. The crew was very professional. Timely estimate and good reputation. We have had a lot of rain in 2011 and our basement has stayed completely dry. No more spending hours cleaning up water. Losing stored items and no more of the wet and musty smell. Also your staff was very honest, courteous and efficient in doing their jobs.